Microsoft Windows NT 4.0 has integrated support for most western languages. It actually has the most advanced internationalization support from all the other Operating Systems of Microsoft. 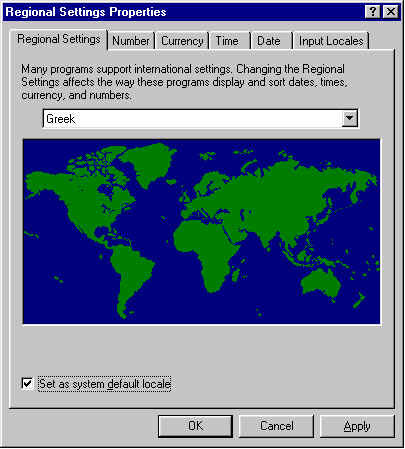 If you bought Windows NT on a CD-ROM, or it came with your computer, you do not need to download additional software to read and write in Greek. The instructions for Windows NT 4.0 are generally exactly the same with the ones for Windows 95/98. The only differences are the ones noted below. Go to: Start -> Settings -> Control Panel -> Keyboard -> Input Local. Click on Add..., and select Greek from the list and press the OK button. You should now see EL Greek [Space] Greek. If the Layout is incorrect, highlight the line for Greek, and click on Properties. There you can select Greek for the Keyboard layout. Before clicking the OK button, make sure that Left Alt+Shift is selected for the Switch languages option, and that the Enable indicator in taskbar option is checked. Also, depending on which language you will be using more often, you can chose to set one of the languages as the default (indicating which keyboard driver should be active when Windows NT starts up). You will be probably be asked to provide your path to the distribution files of Windows NT. If you do not have the Windows NT CD-ROM anymore, you may download the default keyboard driver from here. Go to: Start -> Settings -> Control Panel -> Regional Settings -> Regional Settings. Check the lower left check-box with the indication 'Set as system default locale' and click OK.
You will be probably be asked to provide your path to the distribution files of Windows NT. Once the system copies the new files on your hardisk you will be asked whether you want to reboot. You should say NO. Before you reboot you will need to download the Microsoft Euro Currency Support for Windows NT 4.0. Once you download the NT4_Euro.exe file, double click on it to update your system fonts. This update includes the missing font sizes of the system fonts that come with the distribution of NT 4.0!!! If you are using Office 97, DO NOT Reboot your machine yet, you need to apply the Euro Update for Office 97. Download the file OffTTUpd.EXE, and double click on it to apply the patch. Now you should Reboot when you are asked to do so. Choose English (United States) instead of Greek, BUT DO NOT check the lower left checkbox to 'Set as system default locale' because that way the Greek system fonts will be replaced with the US ones. 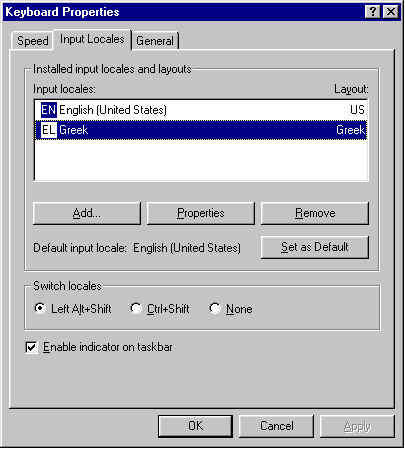 Thus, you can switch your locale to 'English (United States)' but preserve the Greek system fonts.